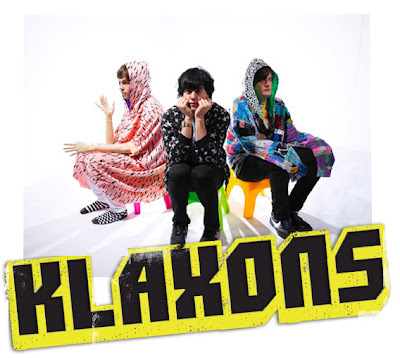 One may start to describe Klaxons with one word: weird. Not the endearing, child-like, joyful ‘weird’, but just – plain weird. The eccentricity doesn’t end there, it echoes along the obscure lines of their music, in the vibe that surrounds it and even in their videos. I have nothing against weirdness; in fact I embrace weirdness (compared to distasteful vulgarity) as long as it’s not weird to the point of making me sick. Klaxons are an English Indie-rock band based in London, England whose sound is categorically construed as art rock. It’s palpable in their musical style of the presence of a supernatural or mystical theme observed in many of their song titles and lyrics, hence the weirdness aforesaid. Some genres that have been associated with the band are such as Psychedelic pop, Indie rock, New-rave, Dance-punk and “acid-rave sci-fi punk-funk” though the band admittedly claims their music as Psychedelic/Progressive/Pop. I just simply call it music that entertains. ‘Golden Skans’ is a song that when it first hits you, you’d quickly deduce it as a weird song (word of the day: ‘weird’), but as you start getting more immersed by each note, it alters into a song that’s likable – its ‘weird-likable’ so to speak. The tune is in fact very likable; likable enough for MTV to have selected it to be played at the background during one of their various award shows, as they have regularly done to an array of good indie, under-rated music that’s available out there. That’s fine, as long as the band doesn’t start selling out or getting over-exposures. If you haven’t listened to the Klaxons, then it should definitely be included in the “101 Things to Do before I Die” list. Here, I’ll give you a hand.